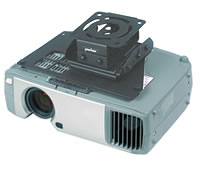 The ENCORE Projector Mount delivers function, Armor Lock security, and versatility. The design allows you to easily adjust the mount independently for roll, tilt, and swivel. This mount is ideal for numerous commercial applications, including classrooms and restaurants. The Encore Mount comes standard with Armor Lock security at every connection point, including at the extension column - a feature offered only by Peerless. The Encore Mount can be flush mounted directly to a ceiling, mounted using a 1½" diameter extension column, or mounted using ½" threaded rod.